The Massachusetts State Quarter was the first of five quarters released in 2000 and the sixth in the state quarter series which was authorized by the 50 States Commemorative Coin Program Act. 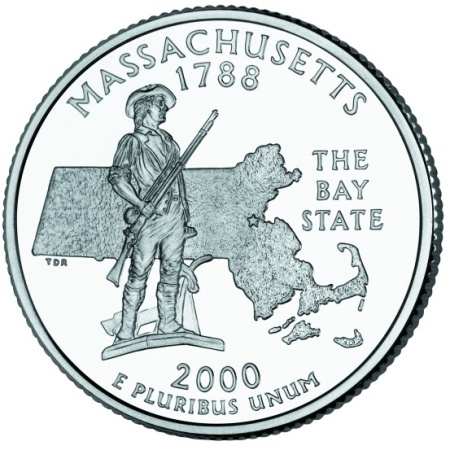 The design features an outline of the state as a backdrop for the main theme of the coin - The Minuteman. "The Minuteman" is a famous statue in the state of Massachusetts that resides at The Minuteman National Historical Park in Concord which pays tribute to the Minuteman of the American Revolution . The Minutemen, made up of colonists and farmers who were ready to fight the British with just a minute's notice, played a very important role in the Revolutionary War. 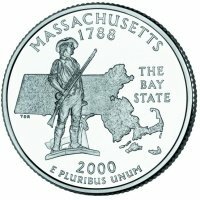 The Governor of Massachusetts encouraged elementary school students to enter a design contest that would determine the state's commemorative quarter. More than 100 designs were submitted which were then narrowed down to five finalists by a 10-member advisory council. After the five finalist's designs were approved by the Secretary of the Treasury, the governor and lt. governor announced the final selection. Both a sixth grader and a seventh grader submitted designs that included The Minuteman. Below is a table showing the design specifications and mintages of the Massachusetts State Quarter. Note: The modification moved some of the wording from the reverse to the obverse to leave the reverse available for the state's design. Reverse - Each state theme was proposed, and approved, by the governor of the state. Final design was created by Thomas D. Rodgers. His initials appear left center just below the outline of the state.